Colorful, high-quality stuffed toys at over 80% off retail price! 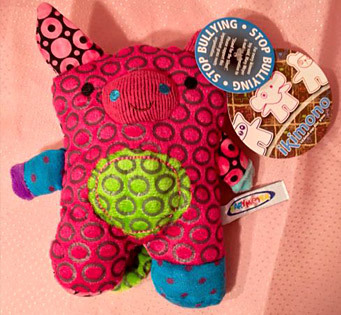 Every Ikimono plush animal features a Stop Bullying tag that says: “Try me, it's easy to make me stand up. It's what I like to do. If you're in a tough spot, I'll stand up for you.” Made by Mary Meyer Stuffed Toy Company, based in Townshend, Vermont. We manufacture over 400 different styles of stuffed animals and other plush toys and distribute them to 12,000 retail stores throughout the USA and Canada. With about 150 new toy designs every year, we need to retire an equal number to make room for the new. This allows Half Price Plush to offer IKIMONO stuffed animals to you in bulk at below wholesale price. You can resell them, use them as gifts or for parties, for charities or fundraising, or for educational events related to bullying. Sold by the case. Order below or call us toll free at 1-800-387-7814.